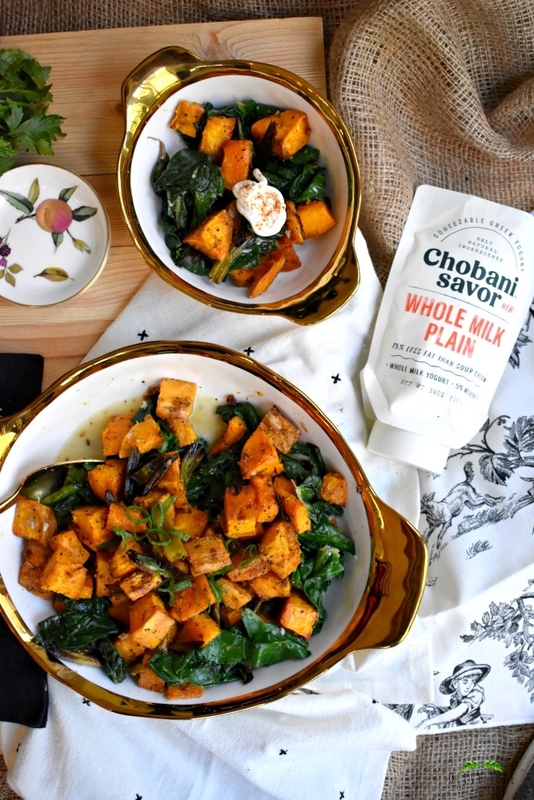 Roasted sweet potatoes and creamy Swiss chard are a perfect pair in this spicy flavor-packed dish. Two great love stories began during my freshman year of college at the University of Pittsburgh. The first one was with my future husband, of course. The second one was with sweet potatoes. Weird, I know. I’m sure Bill can’t believe that I am making this comparison. However, just like I remember the very moment I met him, I distinctly remember the moment I was introduced to a crispy, salty sweet potato fry. They were piled on the plate alongside my portobello burger at Fuel and Fuddle, an on-campus restaurant that my girlfriends and I frequented a lot. I was hooked at first bite and have been ever since. My experience with sweet potatoes up until then was minimal. I’m not sure my mom ever made a sweet potato dish when I was growing up, or at least not one that ever made it into her rotation of recipes. 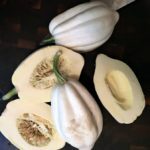 I can recall that at some point, wherever it was, I had sweet potatoes that were most likely popped out of a can, coated with some brown sugar and baked in a dish. It wasn’t until I was out of college and teaching first grade, that I was introduced to the marshmallow-topped sweet potato casserole. I hosted my students’ families for a Thanksgiving feast in my classroom and had no idea that this was a quintessential Thanksgiving side dish. These very sugary ways of preparing sweet potatoes are yummy. I get it. 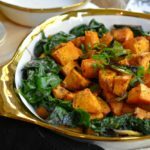 But what hooked me 24 years ago was the savory, spicy, crispy sweet potato preparation that has been a favorite side dish of mine ever since. 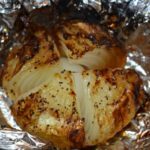 Baked whole and topped with butter and cayenne pepper or diced, tossed and roasted in olive oil, salt, and pepper is the least I can do to enjoy them as part of my meal. I can’t get enough of this savory Sausage and Fennel Loaded Sweet Potato for a special weeknight dinner. When I’m feeling more adventurous, though, this is the dish that really take this love affair over the top. 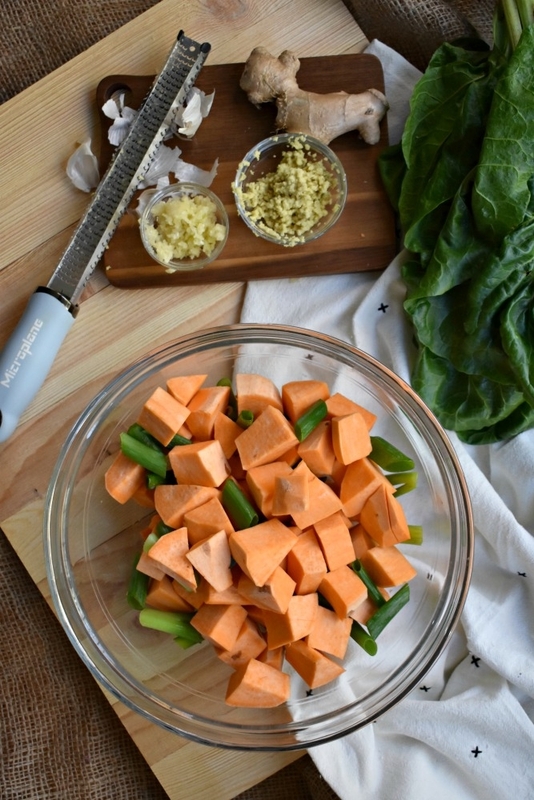 Here, my sweet potatoes get tossed with tons of fresh grated ginger and garlic. 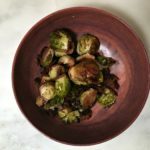 Sprinkled with cayenne pepper and paired with some sliced green onion, these orange beauties get roasted until the edges begin to brown and the onions are charred. Just before the potatoes are done, Swiss chard is sautéed with more ginger and garlic until the green leaves are tender but still bright in color. Finally, they are tossed with coconut milk to add a little creaminess. It’s simple but delicious. 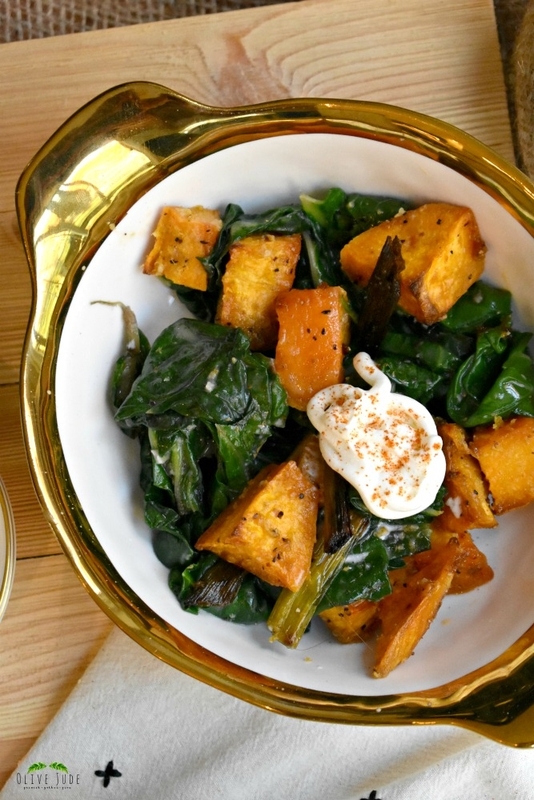 There are crispy, caramelized bits of sweet potato in every bite that pairs perfectly with the heartiness of the Swiss chard. The zing of ginger, the kick of cayenne, and the sweet creaminess of coconut milk is a combination that matches no other. To serve, a dollop of tart Greek yogurt on top works in contrast to the spicy bites. I love these new squeezable Chobani packs that make it easy to add to a dish. 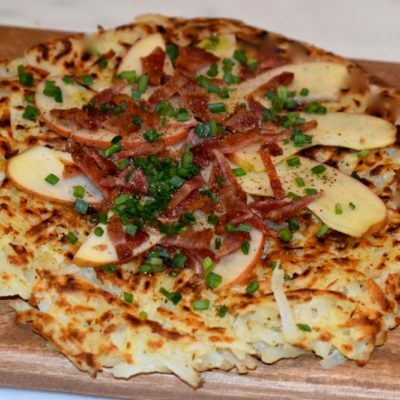 Much like my love for my husband, this dish is magical (too cheesy?)! 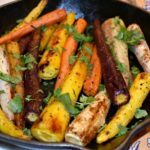 Enjoy my Roasted Rainbow Carrots with Ginger and Cilantro for another delicious side dish with a whole lot of flavor. 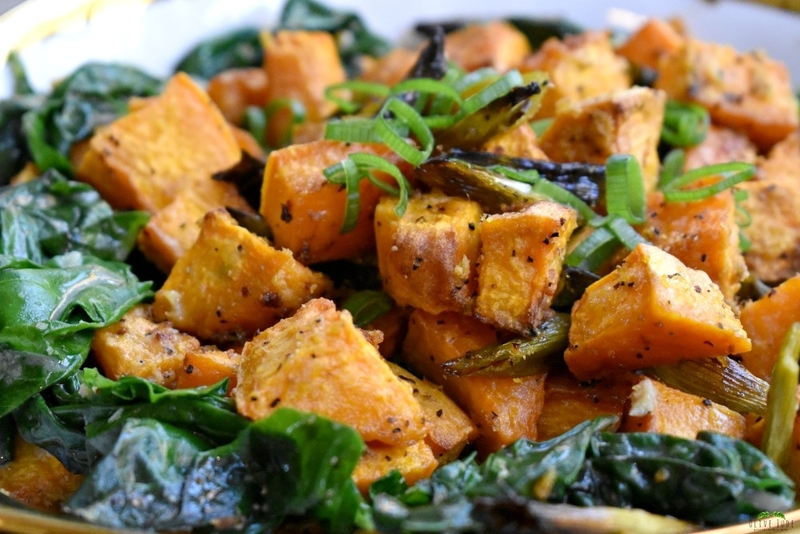 Are you a sweet or savory sweet potato fan? Add all the ingredients to a bowl and toss until well coated. Transfer to the baking sheet and spread the potatoes out, making sure to scrape the bowl of all the ginger and garlic. Roast for 35-45 minutes or until the potatoes are beginning to brown on the edges and the green onions are charred. Just before the potatoes are done, heat the olive oil in a skillet over medium-high heat. If using, add the Swiss chard stalks and cook for about 3-4 minutes. Add the garlic and ginger and cook until fragrant, about 1-2 minutes. Add the torn Swiss chard leaves and sauté, tossing frequently until the leaves are tender and wilted but still green, about 5-7 minutes. Pour in the coconut milk, tossing the Swiss chard so it is evenly coated. Pour the Swiss chard and all its juices in a serving dish. 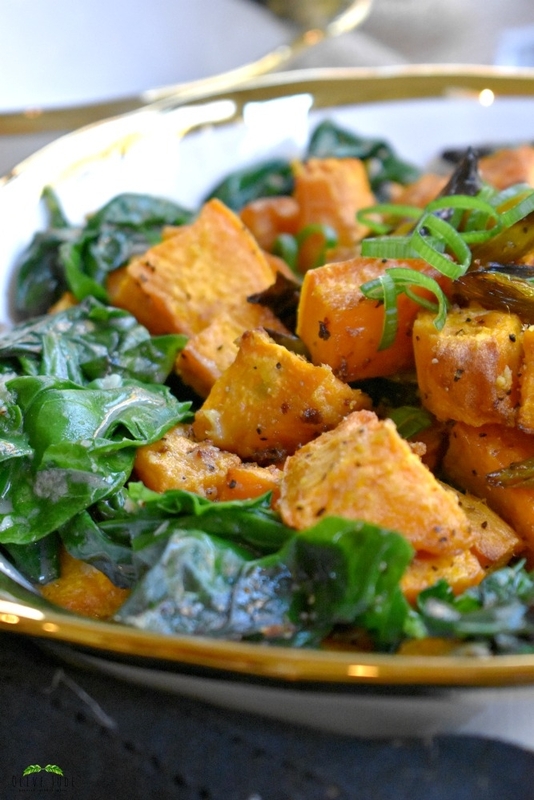 Top with the roasted sweet potatoes, charred onions, and additional thin slices of green onion. To serve, add a dollop of Greek yogurt and cayenne pepper, optional. This sounds so delicious and looks so pretty! I’m going to add this to my menu for next week! I think they’re pretty too but the taste is even better. I think I’m making these tonight, actually. This looks soo good! I need to try making this this season! These looks so delicious and something that my family would love! I love the unique flavor combo and can’t wait to try it! Awesome! Happy you’ll be trying it! I LOVE SWEET POTATOES! I cannot wait to try this recipe. This is definitely not my grandma’s sweet potato dish! I love it. This is full of flavors I love, but never would have thought to combine. I can see why it is a favorite of yours! Right?! No brown sugar and butter here! It’s really delicious! I hated sweet potatoes all my life until about 5 years ago. That’s a lot of wasted sweet-potato eating time! I prefer my savory, too, and these look fab! We have that in common! 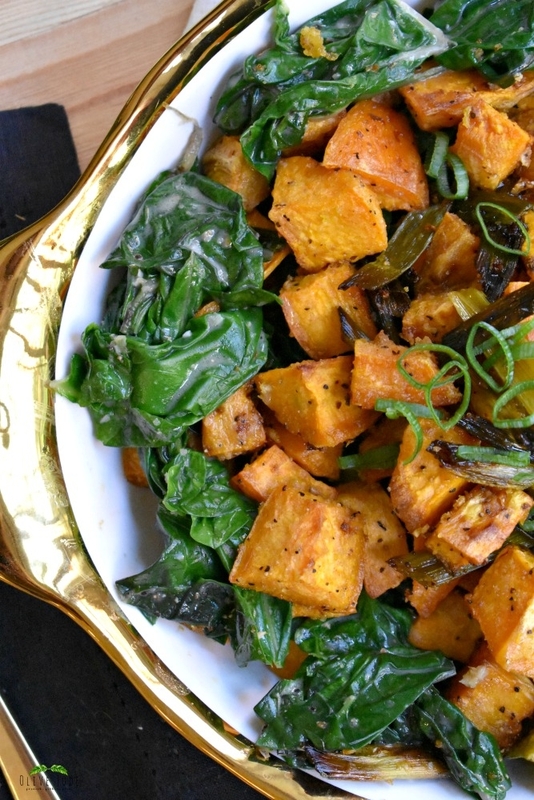 Savory sweet potatoes all the way! I love sweet potatoes! They are probably one of my favorite side dishes. That being said, I definitely need to try out this recipe. I’m trying to eat healthy now and this is a great recipe for me! omg, foogasm. Warm winter salads are my favourite! This looks amazing. I am pinning this right now so I can make! Love this feedback! So fun! Hope you love it! I adore sweet potatoes and I love that comparison, lol!! My husband and I both love sweet potatoes. And we totally don’t need a holiday to eat them. These look amazing and can’t wait to try them! I’m with you…no holiday necessary to devour these beauties. Hope you enjoy them! I like sweet potato dishes. However, the inclusion of garlic and ginger and the lovely tasting coconut milk would, I am sure take this recipe to another level. So sweet! Thank you, Ingrid! It really is a wonderful flavor combo that I just can’t get enough of. This looks so good! I especially like that it is full of ingredients I can also use in other recipes! I can see myself making this often! So good to hear! Thanks for checking it out! Totally flavor packed! I’m so glad you like it! Ooooo I really love sweet potatoes but we don’t have swiss chard here in Cyprus. Do you think it would taste just as good if I added spinach to this recipe in the place od swiss chard? 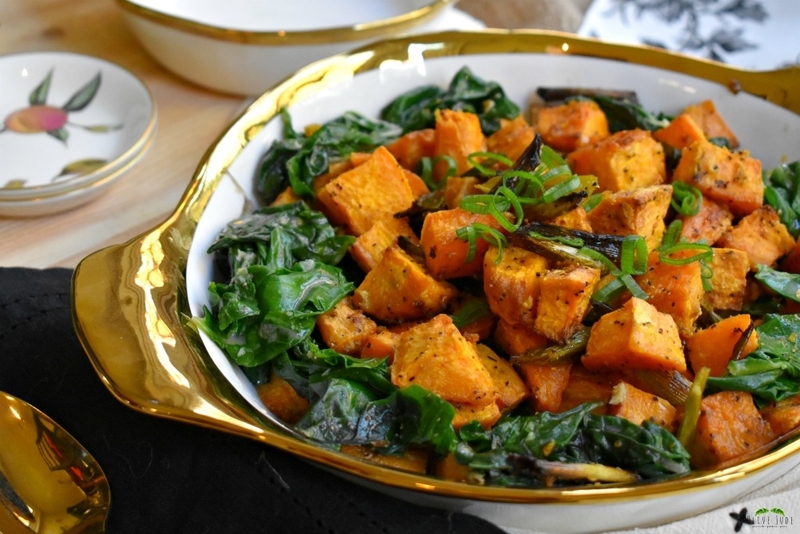 Really would love to try out other recipes with sweet potatoes! Definitely! Spinach, kale, or collard greens would be just perfect here. Just consider adjusting the sautéing time on the greens. Thanks so much for your comment! Thanks, Jenna! Aren’t they the best? Yummy! The sweet potatoes caught my attention because I just love them. I will definitely try this recipe. Great post! So thrilled to hear that, Ashley! Glad it caught your eye! This sounds like the perfect side for Thanksgiving, yum!! Thank you, Susie! We really enjoy it all year long! 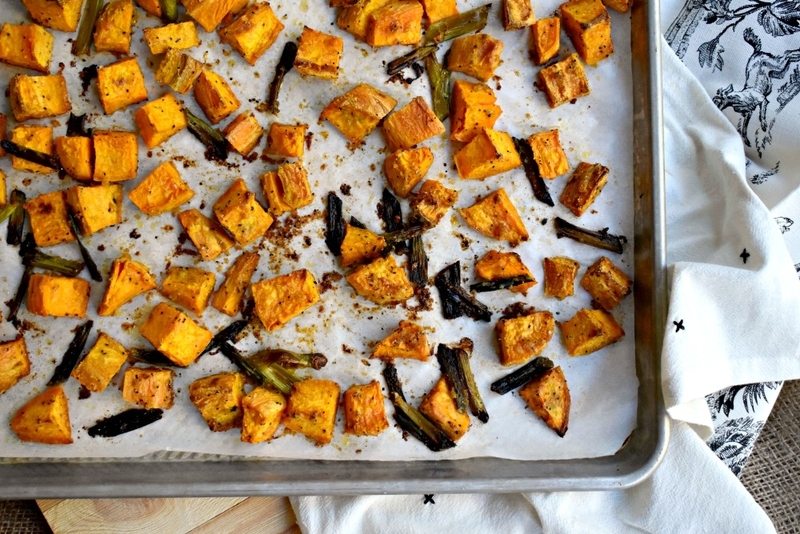 I love this non traditional take on sweet potatoes. I think it would be a fun way to liven up a Thanksgiving menu.The addition of the coconut milk sounds unexpected and yummy. I’m with you! It really pairs well even with the traditional dishes for an unexpected flavor on your plate. Thanks for checking it out! This look super delish and yummy ! 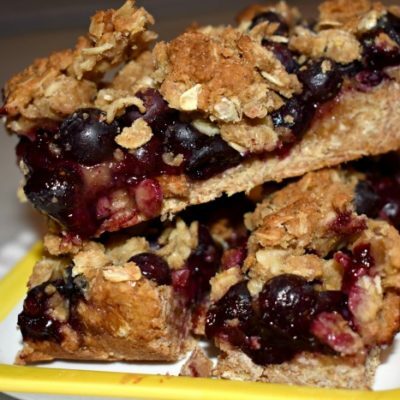 Thank you for sharing this great recipe . I’ve never prepared sweet potatoes like this before! This will definitely have to be on my Thanksgiving Day menu! That’s exciting to hear! Thank you! This looks so good. 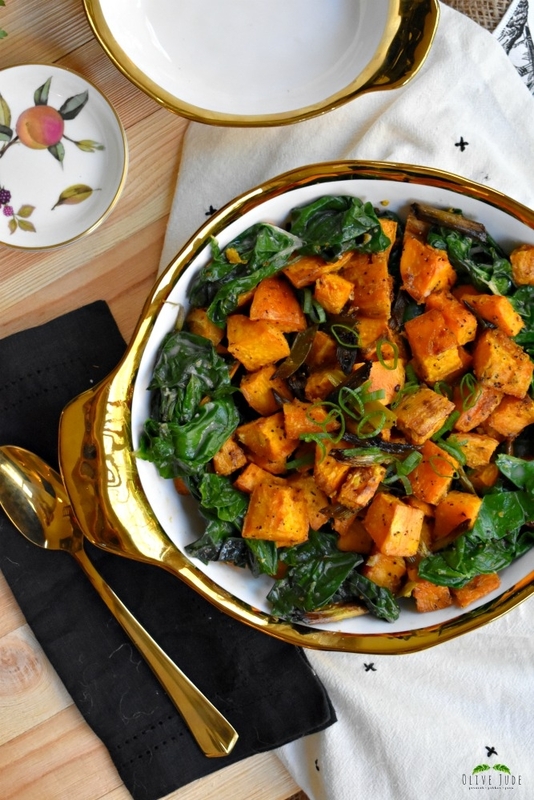 I love all the different savory flavors you can put on sweet potatoes. I agree. 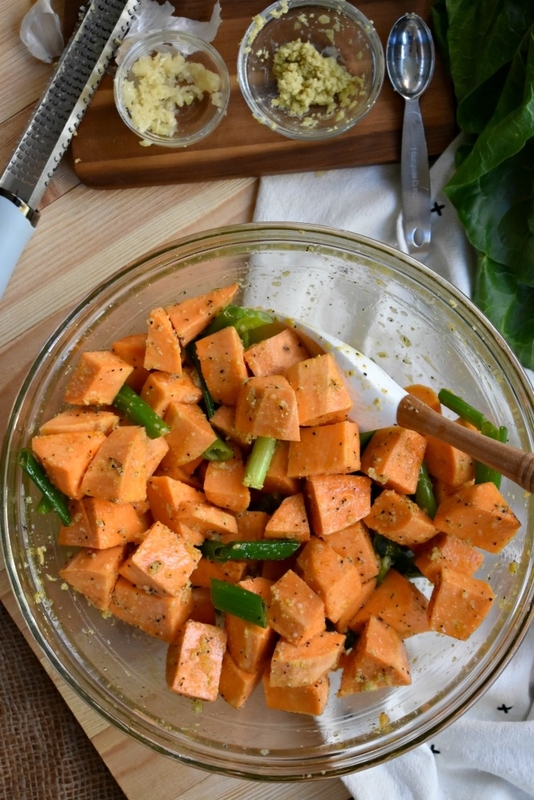 I love adding a flavor punch to sweet potatoes. I’m making this bowl of goodness for our Thanksgiving! This looks so yummy I can’t pass it up! Oh, I’m so glad! I think you’ll love it! This looks so pretty and yummy! 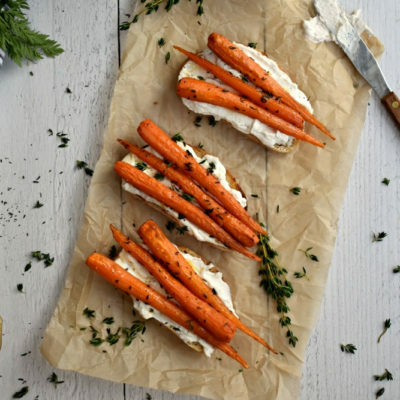 A great dish for the Thanksgiving spread! At first I didn’t realized you had used sweet potatoes. I thought the coloring was from the cayenne or ginger. This looks so scrumptious AND beautiful! I’m going to make it for my elegant Grandma, so I can impress her! I love this, Amy! I hope Grandma enjoys it. Thanks for checking it out! 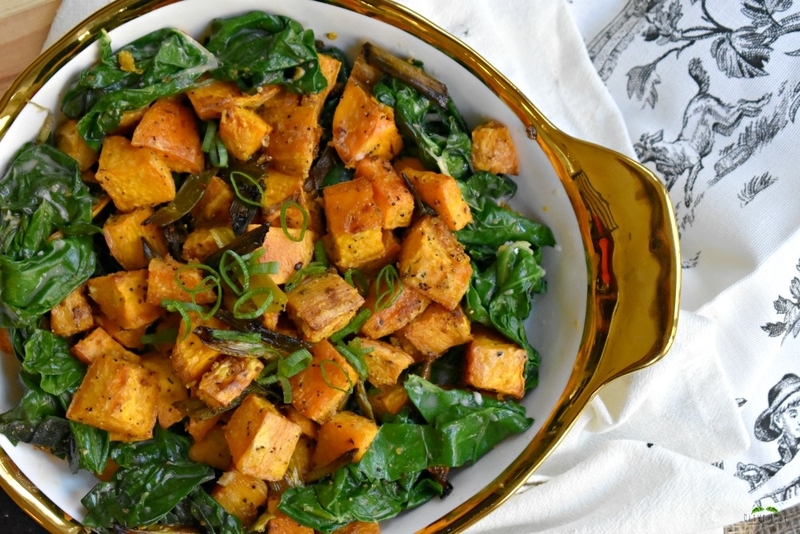 I love sweet potatoes, so this is right up my alley! Yum! I think it’s always nice to add one new dish to the spread. So much yummy goodness on your blog!! Yet another recipe I need to save and try!! Yuummmm!! So nice of you to say! Thank you! Really sure the family is going to enjoy this dish. Honestly I don’t care I am making this especially for me. Yep all about me. Ha! That’s right! The head chef gets to make whatever they want!